According to ancient Okinawan legend, Karate had its beginnings in India with a Buddhist monk named Daruma. Tradition says that Daruma traveled across the Himalayan Mountains from India to the Shaolin Temple in Honan Province of China. There he began teaching the other monks his philosophies of physical and mental conditioning. Legend has it that his teachings included exercises for maintaining physical strength and self defense. This same monk known as Bodhidharma in India and as Ta Mo in China, is credited with founding the school of Buddhist philosophy known as "Ch'an" in China and as "Zen" in Japan. The Okinawans believe that the art known as Karate today came from those original teachings of Daruma through an Okinawan who visited or lived for some time in China at the Shaolin Temple. Whether or not this is true, it is obvious that there are similarities in the Okinawan art of Karate and the language and martial arts of China. Further, we must assume that the Karate of Okinawa developed from trial and error of fighting experiences into a different and unique martial art. In the ancient Okinawan language of Hogen, the word for China is Kara-no-Kuni and, as much of the original technique of the martial art practiced in Okinawa originated in China, the art became known as Kari Te or "Chinese Hand". Another term later developed to distinguish the art of Okinawa from the Chinese martial arts was "Tode" or "Okinawan Hand". "Te", meaning the martial art of the hand, implies that the human body is trained to become all the weapons a man or woman needs for self-defense. It is believed that "Te" is at least 1,000 years old. The term "Karate" as used today means "empty hand" and has the same meaning. Master Gichin Funakoshi, an Okinawan who founded the famous Shotokan style of Karate in Tokyo, Japan in the late 1920's, is credited with changing the original kanji character for "Kara" meaning China to "Kara" meaning empty. The development of "Te" continued over many years and was mostly practiced in secret by only a few individuals. Development was centered primarily in the three Okinawan villages of Shuri, Naha, and Tomari-te and each village had a master who is credited with developing the style unique to that area. Again, the very early history of "Te" is shrouded in legend. It is believed that a man named Chatan Yara (born 1668) in Shuri was sent to China at the age of 12 to learn the Chinese martial arts. In 1700, he returned to Shuri and began to teach. One of his students was Takahara Peichin who is most famous as the Sensei of the man who later became known as "Tode" or "Karate" Sakugawa. The legend says that Sakugawa began training with Takahara in 1750 and later went to China where he trained for many years. He is credited with introducing the Dojo concept of training to Okinawa. The most famous student of Sakugawa was Matsumura Sokon (born 1805) who was sent by the royal family of Okinawa, Sho Shi, to study at the Shaolin Temple in China in 1815. He returned to Okinawa and was appointed the chief bodyguard for the King Sho Ko. Since he lived in the royal village of Shuri, his style became known as Shuri-te. Matsumura was awarded the tide of "Bushi" or Samurai and became known as "Bushi" Matsumura. He died at the age of 87, leaving a legacy of many famous students. Itosu, Ankoh (Yosutsune) (1830-1915) was the most famous student of Matsumura. He is credited with introducing Karate into the Okinawan public school system in 1903. Prior to this the practice of Karate had been done privately in the homes of the masters and in many instances, was done in secret. Perhaps Itosu's major contribution to the art of Karate was his emphasis on kata. He taught that a student had to be able to put the body under complete control of the mind before any other type of development can take place. Kata, he taught, is the best method of achieving this type of mind control. According to him, mobilization of the body, control of the breath, stilling the mind, and concentration are made possible through the practice of Kata. Itosu believed that through Karate man can channel aggression. He said, "Karate is a way of life, a means to achieve complete security and fearlessness." To him, Karate was a method of character development and not a way of attaining fame. 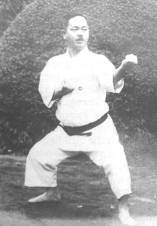 He is also credited with developing the Chanan Kata which were later known as the Pinan Kata and now are called Heian Kata. In the village of Naha, Higaonna Kanryo (1853-1915) made his style of Naha-te very popular. when he was 17 years old, he went to Fu-Chien, China to study and remained there for 28 years. After his return from China, Higaonna opened a dojo in Naha. His best student was Miyagi, Chojun who later created the Goju-Ryu style of Karate. Since Tomari was a town or farmers and fishermen, it was scorned by the villagers or the more sophisticated Naha and Shuri. However, many Chinese fishermen came to the port of Tomari and the people there also learned a martial art. The two primary sensei of Tomari were Matsumora (1829~ 1898) and Oyadomari (1831-1905). These men never became as famous as Itosu or Higaonna but they each taught men who later played an important role in the history or Karate. Oyadomari taught Kyan Chotoku (1870-1945) who created one or the three styles of Shorin-Ryu Sukunaihayashi Shorin-Ryu. Matsumora's student Motobu, Choki (1871-1944) became known as an excellent fighter and was the sensei of Kokuba, Kosei, the founder of SEISHIN-KAI. Motobu, Choki also studied with both Higaonna and Itosu and developed a style unique to him. There is some evidence which suggests that Shuri-te derives from Shaolin Temple boxing, while Naha-Te incorporates more of the soft, Taoist techniques involving breathing and the control or "Ki", the "Life-Force", called "Chi" in Chinese. Tomari-te developed from both traditions. 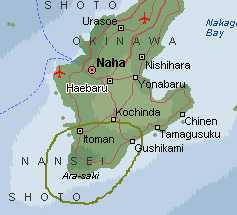 It is important to note that the towns of Naha, Tomari and Shuri are only a few miles apart and today, are barely differentiated, so that the differences between their martial arts were essentially ones of emphasis, not of kind. Beneath these surface differences, both the methods and aims of all Okinawan Karate are one and the same. In the words of Goju-Ryu Sensei Morio Higaonna, "...Karate is like a cloud with nothing substantial to grab hold of. Karate is very difficult, but its purpose is to train both the mind and the body. Karate is something you can do your whole life. In Okinawa a bushi is someone who has discovered the correct way of life and achieved a placid mind through Karate training. Training is necessary for human beings to achieve this state of mind." Sensei Higaonna's statement sums up the basic philosophy of all Okinawan Karate. 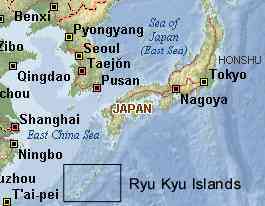 During the time that the art or Karate was being developed in Okinawa, Japan conquered the tiny kingdom in 1609 and it became a Japanese territory. The conquering Japanese actually helped further the development of the martial art by banning the use of all weapons; only the Japanese samurai were allowed to carry swords. Forced to practice in secret, the Okinawan masters developed and perfected kata. Kata are composed of a series of techniques which can be practiced alone or with a partner. Since kata resemble the traditional folk dances of Okinawa, anyone caught practicing the martial art could claim to be only practicing a harmless folk dance. Different masters developed kata unique to their style and, thus kata became the primary method of transmitting the style of each master from one generation to another. This remains true today as the primary distinctions in Karate styles lie in the way in which the style or ryu performs kata and which kata are performed within that ryu. By the end or the nineteenth century the names of the three basic styles of Karate in Okinawa had changed to the same names that are used today. The arts of Shuri and Tomari were combined into one name, Shorin-Ryu, meaning the "flexible pine school". Naha-te became known as Goju-Ryu, the "hard and soft school." Shorin-Ryu has developed into several different sub-styles but Goju-Ryu has remained unified stylistically. Mabuni Kenwa (1889-1952) a student of both Master Itosu (Shorin-Ryu) and Master Higaonna (Goju-Ryu) developed his own style from a combination of both Shorin and Goju and this style is called Shito-Ryu. Shito-Ryu as a name was developed from the reading of the kanji characters of names of Itosu and Higaonna. The Chinese characters (Kanji) used to write Japanese names can have two pronunciations. Master Mabuni named his style "Shi" from "ITO" and "To" from the "HIGA" of Higaonna. Today Shito-Ryu is one of the four major styles of Karate practiced in Japan. During the time that the art of "te" was developing in Okinawa, the Japanese did not have a similar martial art. They practiced Judo, Jiu Jitsu, Kendo and other sword arts but not an art with the emphasis on the "empty hand" as the primary method of self defense. The Japanese martial arts involved grappling as in Judo or a weapon as in Kendo. Therefore. when a visiting crown prince of the Japanese royal family saw a demonstration of "Karate" in Okinawa, he was greatly impressed. He extended an invitation for an Okinawan master of Karate to visit Japan and give a demonstration. The Okinawan Sensei discussed this and chose Funakoshi, Gichin, a student of Master Itosu to go to Japan and present the demonstration. He was chosen because he was a school teacher who could give more lucid explanations of the art of Karate. Master Funakoshi gave his famous demonstration in Tokyo in 1922 and was so well received that he never returned to his homeland of Okinawa. Instead, he remained until his death in Japan and he established the style known as Shotokan. Thus, Karate, the art that had begun in secret in Okinawan villages spread to Japan where it would grow into an international art practiced today in many countries all over the world.